The Mock Trial / Moot Court eat and greet was a chance for Grady High School's Mock Trial and Moot Court programs, which both deal with law and presentation, to meet and spend an evening getting to know eachother. Both teams enjoyed time at the pool and a cookout together on August 2nd at a Moot Court member's apartment complex pool. Mock Trial and Moot Court students are all smiles at the eat and greet! Students enjoy one of their last evening of summer at the Mock Trial Eat and Greet. 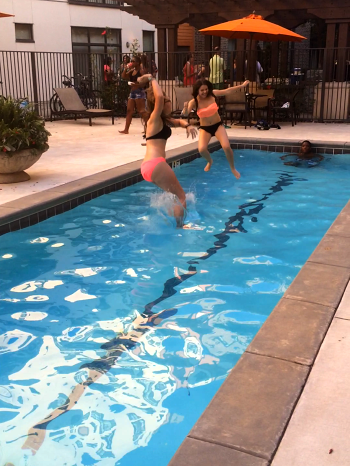 Mock Trial students Elizabeth Lansing and Ali Bouterse show off their best cannonballs.